We. As in the whole family. It was truly such a special, amazing day. We got our pictures back from our awesome photographer Amber a few weeks ago, and it's been fun to look through them and relive the day. Seriously, so special and meaningful in so many ways. Here are just a few photos to give you a glimpse of our wedding day. I'll add links to YouTube videos of the songs we played too, because we were very purposeful to include songs with lyrics that really meant something and added a lot of sentiment to the day. This is when I first arrived. We got married at The Benicia Clock Tower, this rustic old historical building. We were going for an industrial look, so it was perfect. The only downfall was that it was a rather warm day, and there was no air conditioning, just a large fan. It would have been nice to have a little more air circulating, but I don't think it kept anyone from having a good time. 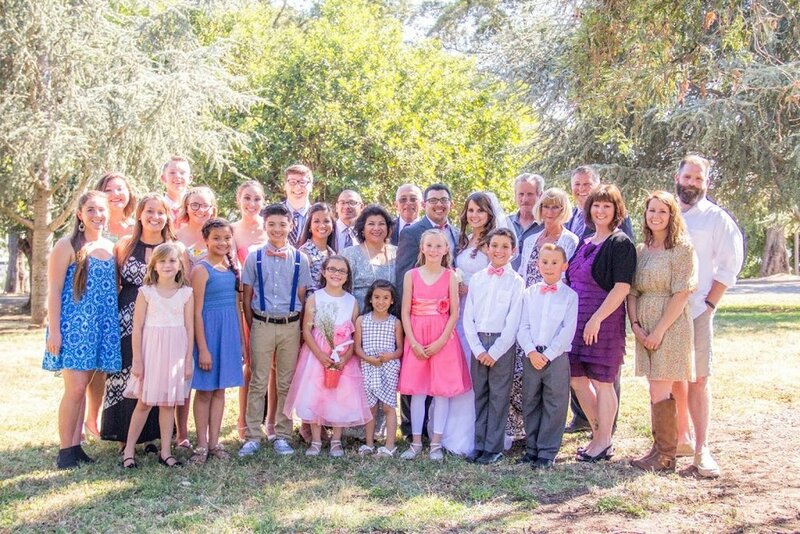 We decided from the beginning that our kids would play significant roles in our wedding ceremony, as our union really includes all of them too. Al's (9 year old) son was his best man. This is them waiting to take their places at the front of the building. As guests were taking their seats before the ceremony started, we played Sara Grove's song "Fly". There's an elevator from the lower level of the building up to the main hall, and this is where the rest of the kids and I came in from. It brought us in through the kitchen, which was nice because it was a private area where we weren't seen by guests until it was time... and also because the kitchen is in the middle of the hall and I didn't want to make the long walk all the way from the back of the building with all eyes on me! The song playing while Al and the kids came in and took their places was "Beautiful Things" by Gungor. Our hope for the day was to display God's goodness in taking two broken families and making something beautiful and new. We are in awe of His love and how He's blessed us. 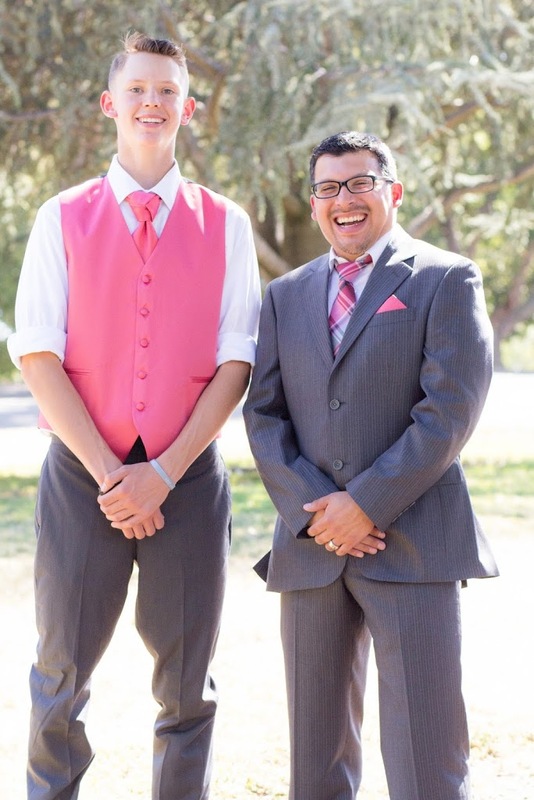 One of my very favorite parts of the day was having my oldest boy walk me down the aisle. He took it the hardest when his dad left and really didn't like the idea of me being in a new relationship in the beginning. He slowly warmed up to it, but when we first talked about getting married, he resisted again. Through lots of talks and lots of prayer, he has come to accept it, and when Al talked to my two oldest kids before asking me to marry him, they both gave him their blessing. 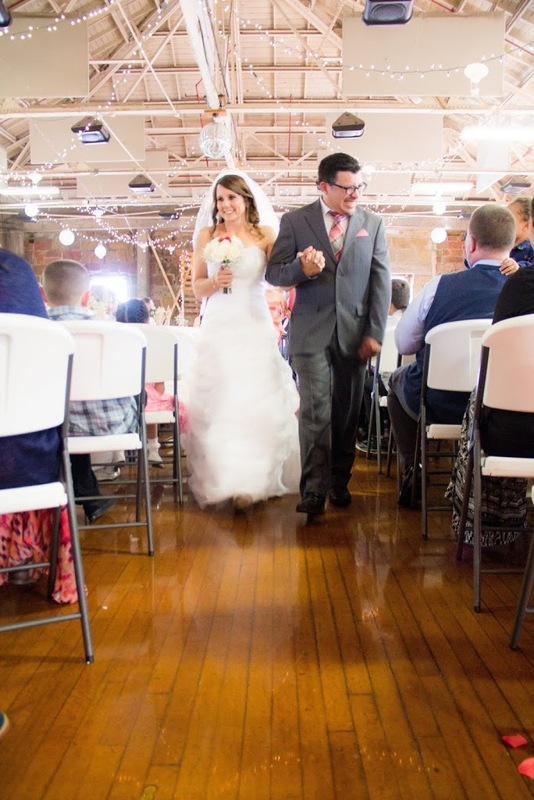 To have Zeke walk me down the aisle meant the world to me. We walked in to "At Last" by Etta James. Our ceremony was beautiful. 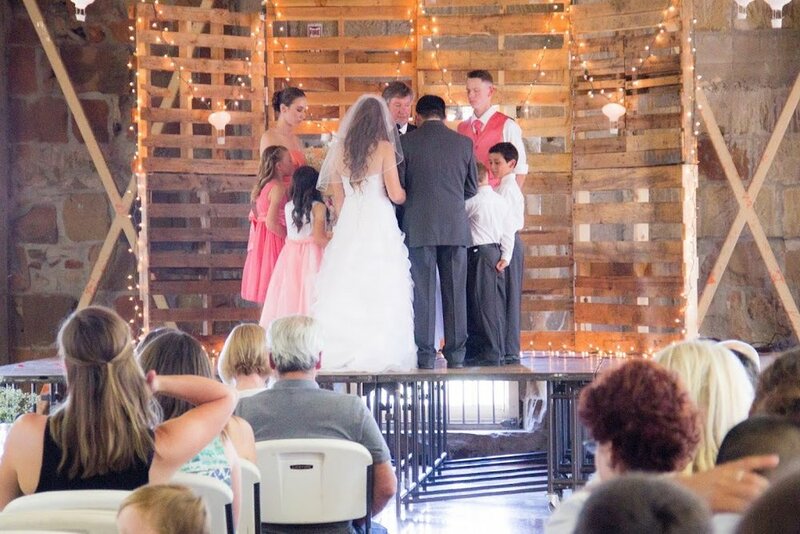 We wrote our vows to each other, the songs were so perfect for us, and we included the kids in every detail. The girls were so sweet. Mercy, who never wears dresses, agreed to wear one for the wedding and looked so pretty. Amelie was our flower girl, carrying some petals in a little bucket. Friends told me later that throughout the ceremony, she would look around to see if anyone was watching, and then casually drop a few petals where she was standing on the stage. So cute. Then there's Brooklyn. Holy moly. What a beautiful young lady she has become. And these boys. Oh my goodness. They were a crack up the whole time. So handsome, full of giggles, totally adorable. During communion, we played "I Won't Walk Away" by Frontline Worship. 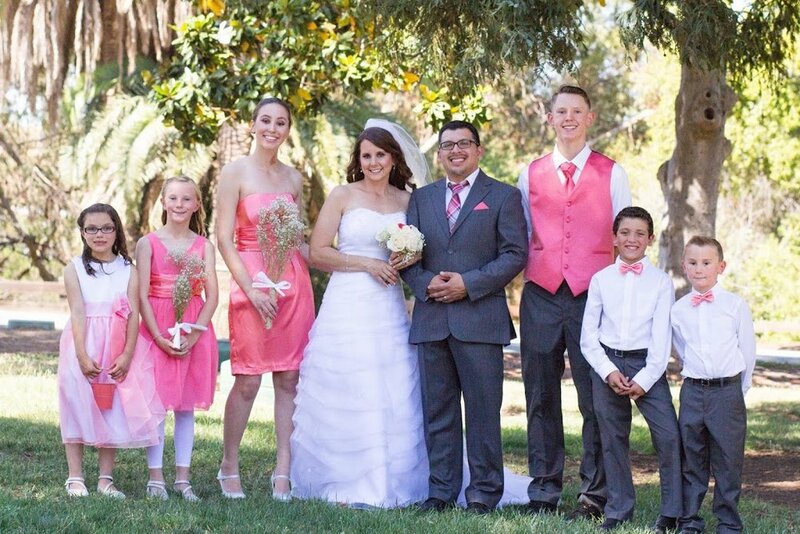 Because we know marriage is hard, and we know having a blended family will have challenges. But we are committed to each other and to our kids through the good times and the hard times. "Nothing will take away, nothing can keep at bay the promise and commitment made. I won't walk away. If it's hard, I'll carry it. If it hurts, I'll bury it. Let it come, let it go. I won't walk away. I believe every word that I said and I heard. No I won't change my mind, I won't walk away." 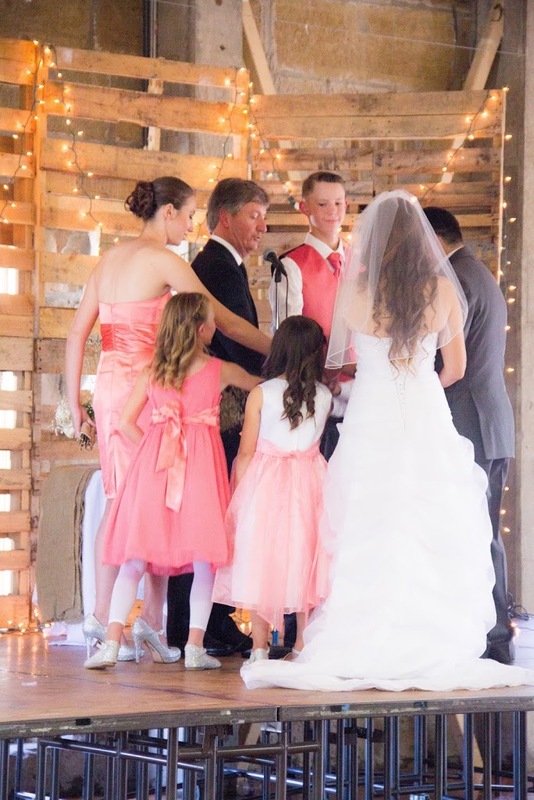 After communion, we gathered in a circle and our pastor prayed over our new family. I LOVE that our photographer caught this picture of the boys during the kiss. Priceless! I think someone was a little excited that we were pronounced husband and wife, and that it was finally time to party! We walked out to a song called, "Look They're Blending" from the movie Blended. 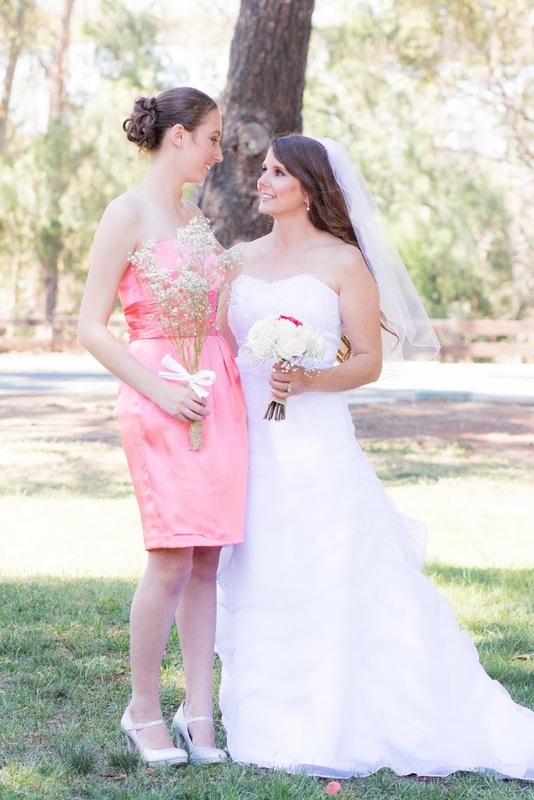 My beautiful daughter and maid of honor. Both sides of our family all together. I love this so much. Just missing my dad and stepmom, who were unable to make it. 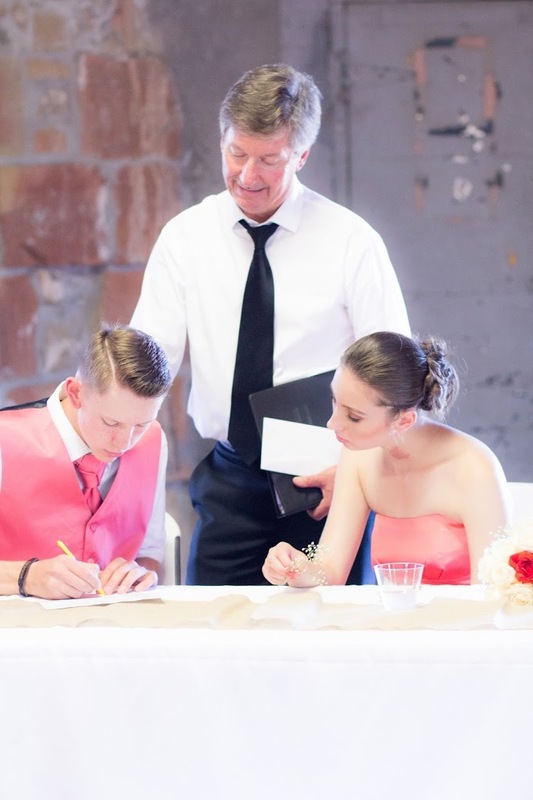 Brooklyn and Zeke were our witnesses and signed the marriage license. Our first dance. Al is laughing because I told him I was glad this was the last thing we had to be in the spotlight for, and then we could just be together with our guests. I'm so not good at being the center of attention! We danced to JJ Heller's "Tonight". The rings I wore on either side of my engagement ring were Al's grandmother's. She passed away about a year ago, but when I met her literally the day after we started dating, she gave me a bracelet and earrings to wear for our wedding. We missed her that day, but I'm so thankful for the memory of her giving me her jewelry, and I've been wearing the earrings every day since! Woohoo! Look at my handsome husband!!! I'm so thankful for this man!